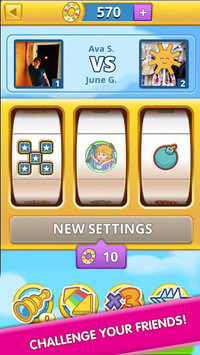 Have a blast with your friends in the hottest new multiplayer game Slingo Blast! Prepare for lift off! 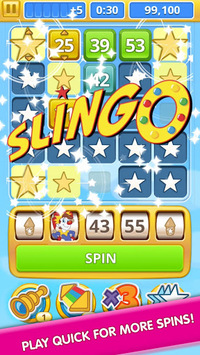 Have a blast with your friends in the hottest new multiplayer game: Slingo Blast! Enjoy Slingo gameplay with the new challenge of facing off with opponents in time-based rounds, beating their score, and moving up in the ranks of the regional and global leaderboards! Slingo Blast pits friends against friends or a random opponent in a collapse mode version of 5x5 Slingo. 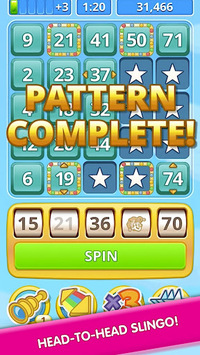 As numbers are eliminated by creating horizontal, vertical or diagonal lines, more will fall in to take their place. The more Slingos you make, the higher your score climbs! Want to really boost your score? Then power-ups are the answer. Use them at just the right time to get a x3 points multiplier or instant Slingos with a burst of blast tiles. Use them wisely to gain an edge over your opponents! -	Gain XP to get FREE power ups! -	Check the leaderboards to see how you rank amongst your friends, country or around the world!